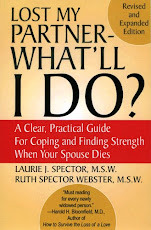 LOST MY PARTNER blog: lost your appetite since losing your spouse/partner? lost your appetite since losing your spouse/partner? Feel like nothing will ever taste good again? Wish people would stop nagging you to eat when you just don't feel hungry? If your spouse/partner has recently died, you probably haven't felt much like eating. It's not uncommon to feel a loss of appetite in the first month or so after a death, when your body as well as your mind is in a state of shock. Keep in mind that your appetite should slowly begin to return with time. In any case, always make sure your doctor knows about your recent loss and any prolonged problems you have with your appetite. Dietary changes can bring about changes in your brain structure, both chemically and physiologically. Those changes can improve mood and mental outlook. Here are 10 tips for eating if you or a loved one is recovering from clinical depression. Nutrients in foods support the body's repair, growth, and wellness. Nutrients we all need include vitamins, minerals, carbohydrates, protein, and even a small amount of fat. A deficiency in any of these nutrients lead to our bodies not working at full capacity – and can even cause illness. Damaging molecules called free radicals are produced in our bodies during normal body functions – and these free radicals contribute to aging and dysfunction. Antioxidants such as beta-carotene and vitamins C and E combat the effects of free radicals. Antioxidants have been shown to tie up these free radicals and take away their destructive power. The connection between carbohydrates and mood is linked to the mood-boosting brain chemical, serotonin. We know that eating foods high in carbohydrates (breads, cereal, pasta) raises the level of serotonin in the brain. When serotonin levels rise, we feel a calming effect with less anxiety. So don’t shun carbs – just make smart choices. Limit sugary foods and opt for smart carbs, such as whole grains, fruits, vegetables, and legumes, which all contribute healthy carbs as well as fiber. Foods rich in protein, like turkey, tuna, or chicken, are rich in an amino acid called tyrosine. Tyrosine boosts levels of the brain chemicals dopamine and norepinephrine. This boost helps you feel alert and makes it easier to concentrate. Try to include a protein source in your diet several times a day, especially when you need to clear your mind and boost your energy. Good sources of protein foods that boost alertness: beans and peas, lean beef, low-fat cheese, fish, milk, poultry, soy products, yogurt. The Mediterranean diet is a balanced, healthy eating pattern that includes plenty of fruits, nuts, vegetables, cereals, legumes, and fish. All of these are important sources of nutrients linked to preventing depression. A recent Spanish study, using data from 4,211 men and 5,459 women, found that rates of depression tended to increase in men -- especially smokers -- as folate intake decreased. The same increase occurred for women -- especially those who smoked or were physically active -- but with a decreased intake of another B-vitamin: B12. This wasn't the first study to discover an association between these two vitamins and depression. Researchers wonder whether poor nutrient intake leads to depression or whether depression leads people to eat a poor diet. Folate is found in Mediterranean diet staples like legumes, nuts, many fruits, and particularly dark green vegetables. B12 can be found in all lean and low-fat animal products, such as fish and low-fat dairy products. Vitamin D increases levels of serotonin in the brain. Researchers, though, are unsure how much vitamin D is ideal. There are individual differences based on where you live, the time of year, your skin type, and your level of sun exposure. Researchers from the University of Toronto noticed that people who were suffering from depression, particularly those with seasonal affective disorder, tended to improve as their levels of vitamin D in the body increased over the normal course of a year. The recommendation is to try to get about 600 international units (IU) of vitamin D a day from food if possible. Selenium is a mineral that is essential to good health. In a small study from Texas Tech University, supplementation of 200 micrograms a day for seven weeks improved mild and moderate depression in 16 elderly participants. Other studies have also reported an association between low selenium intakes and poorer moods. We know that omega-3 fatty acids have innumerable health benefits. Recently, scientists have revealed that a deficit of omega-3 fatty acids is associated with depression. In one study, researchers determined that societies that eat a small amount of omega-3 fatty acids have a higher prevalence of major depressive disorder than societies that get ample omega-3 fatty acids. Other epidemiological studies show that people who infrequently eat fish, which is a rich source of omega-3 fatty acids, are more likely to suffer from depression. Sources of omega-3 fatty acids: fatty fish (anchovy, mackerel, salmon, sardines, shad, and tuna), flaxseed, and nuts. Sources alpha-linolenic acid (another type of omega-3 fatty acid): flaxseed, canola oil, soybean oil, walnuts, and dark green leafy vegetables. Thanks for your comment, Holy. We're glad to hear this information helped.